Tornados, floods, wildfires, hurricanes and blizzards are volatile forces of nature that leave a wake of destruction in their paths. Broken trees and fences, shattered homes, decimated forests and much more can leave mountains of debris for disaster recovery crews to clean up in the weeks, months and even years to come. Much of this debris, such as bark, vegetation and telephone poles can be easily disposed of by using an air curtain burning machine. While unavoidable, natural and artificial disasters do not have to take years to clean up at unthinkable costs. In more and more of these situations, air curtain burners are arriving on the scene to help make the cleanup more manageable. You have probably heard of air curtain burners but may not totally understand the science behind them. These specialized, reinforced biomass burn boxes are powered by air curtain technology that uses a stream of air to trap the initial smoke output and force it back into the heart of the burn. The original smoke and particulate matter (PM), such as black carbon, is then burned a second time. The end result is an extremely low output of smoke and PM into the environment. If you stood by and watched, you would actually see something more like heat waves radiating out of the box instead of the billowing black smoke common in pile burns or open burns. In fact, EPA testing shows the opacities are well under 10 percent, as opposed to 80 to 100 percent opacity in an open burn. According to a study performed by the USDA Forest Service at the Missoula Fire Sciences Laboratory, the air curtain burner is extremely effective in reducing PM2.5 emissions. In regions already ravaged by fires, tornados, hurricanes or floods, the value of reducing additional negative environmental impact cannot be overstated. Basic Principle of an Air Curtain Burner or Distructor. A disaster response plan is the first step towards making a catastrophic event more manageable. In the aftermath of a disaster, waste management is always in the spotlight. The community is relying on recovery crews for a quick and efficient response. When disaster strikes, a sensible waste management contingency plan is worth its weight in gold. When Hurricane Katrina hit in 2005, Beverly Companies, who provides Southeast Louisiana with trucking and disposal services, were among the first boots on the ground. Experiencing no flood damage itself, Beverly was able to mobilize quickly, providing dumpsters and hauling loads away to help with the cleanup. Even with their active response system in place, it took a year and a half to two years of nonstop work on everyone’s part to get on top of the disaster. Since then, they have continued to hone and refine their disaster response plan for even more efficiency in the future. Can obtaining an air burner help minimize the impact of future disasters? Yes, and in areas hard hit by regular tornados, floods, hurricanes and wildfires, it makes sense to include them in your disaster response plan. For flood-prone areas, grapple trucks can be used to load trees and debris into an air curtain burner machine to keep a steady burn going all day long. For dry regions prone to wildfires, air curtain burners provide a way to dispose of slash piles that keeps the danger of igniting another wildfire to a manageable level. For tornado alleys, air curtain burners are a great standby to clean up the wreckage left behind. 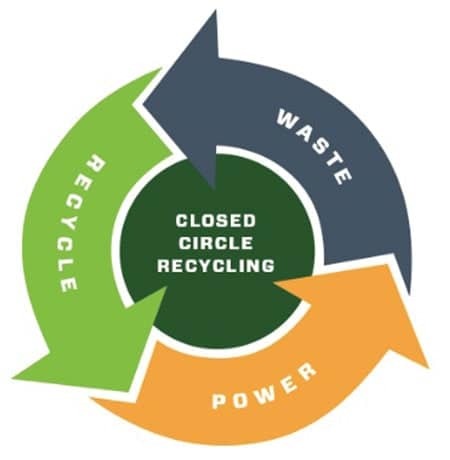 The Concept of Closed Circle Recycling. On October 3 – 5, 2013, South Dakota was slammed by Storm Atlas, a freak blizzard driven by 55 to 70 mph winds that dumped multiple feet of snow across the state. Caught unprepared so early in the season and still in summer pastures, cattle, sheep, horses and other animals fell victim to the elements. Trees, fences, telephone poles and power lines were blown down, creating a three-day blackout for much of the state. With livestock losses in the tens of thousands and widespread structural damage estimated at over $1.7 billion, the governor declared a state of emergency for South Dakota. Each town began the arduous task of cleaning up. Roll-off dumpsters were dropped off at central locations but were quickly overwhelmed. Little-used parking lots became the new drop-off locations and steady streams of trucks and trailers hauled load after load of trees, brush, lumber, posts and debris to the lots. Regular removal could not keep up with the demand. The towering debris piles were landmarks for almost two years as the state struggled to get on top of the cleanup. While this story is not unique, it does show the need for air curtain burners to be on-hand and part of a good disaster preparedness plan. These mobile burners, placed strategically and moved periodically, could have expedited the cleanup process and reduced the risk of contaminated water. More recently, the California wildfires, including the infamous Camp Fire, left a wake of devastation with dead trees and wood waste that overwhelmed cleanup efforts. Air curtain burners have gone a long way to help restore some order to these regions. Hurricane Maria in 2017, a Category 5 hurricane, became the worst natural disaster in history for Puerto Rico, Dominica and the U.S. Virgin Islands. Puerto Rico, already suffering from a broken waste management system, was decimated and needed an affordable solution for dealing with the debris. Air curtain burners are perfectly suited for these exact situations, designed to fit into shipping containers for easy transport. Within a short time, Puerto Rico and other areas affected by Hurricane Maria could have been cleaning up with these biomass burning workhorses. As soon as the storm or event has passed, you are able to bring out the air curtain burners. They can easily be trailered in on a flat bed or there are some options that can be towed behind a truck. For a huge disaster with wide areas of devastation, the air curtain burners are usually placed in central locations. If it is a more isolated damage, it is recommended to place one near the damage, or at the local landfill. These machines are typically set up in a field with about 100-foot diameter of clear area. Typically, air curtain burners are used short term for disaster clean up. These machines can be rented from dealers of private individual owners. If you are more interested in a long-term situation, there is a variety of air curtain burners available for purchase. It is very common for cities and towns to purchase a machine for their local landfill. This machine could be used at the landfill year-round and also be able to help in times of need for disaster cleanup. Can Good Come from Disaster? 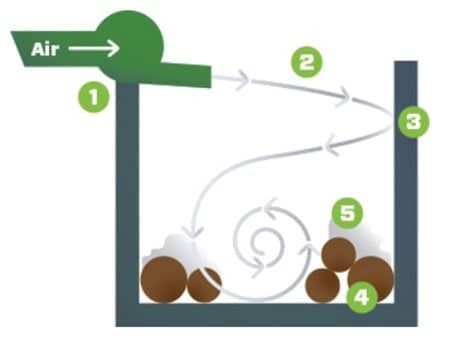 In addition to the obvious benefits of being able to quickly and easily eliminate wood waste and vegetative waste, air curtain burner systems also give back in unexpected ways via two burn byproducts that can help offset the cost of the machine. The first by-product of air curtain burners is BioChar. This is a desirable form of charcoal left from the burn that can be recycled, sold or turned back into the soil to enrich it. The second byproduct of a biomass burner with a power generator is the ability to get rid of waste while simultaneously producing energy. The energy produced can then be used to power additional equipment around your job site, such as chargers, trailers, lights, kilns, etc. There is even a biomass burner with a power generator that can produce up to 1MW of energy. That is enough to power a small town. For many, these additional benefits often tip the scales when it comes to including an air curtain burner system in their disaster response plan for efficiently handling cleanup of natural disasters or accidents. Norbert Fuhrmann is Vice President of Air Burners, Inc. (Palm City, FL). He has been with Air Burners, Inc. for 20 years and has worked in the field of high-tech manufacturing and sales for most of his business career. For more information, call (772) 220-7303 or visit https://airburners.com/.